Preferred Media General Manager Rob Gallimore was featured in the June issue of Content and Technology. 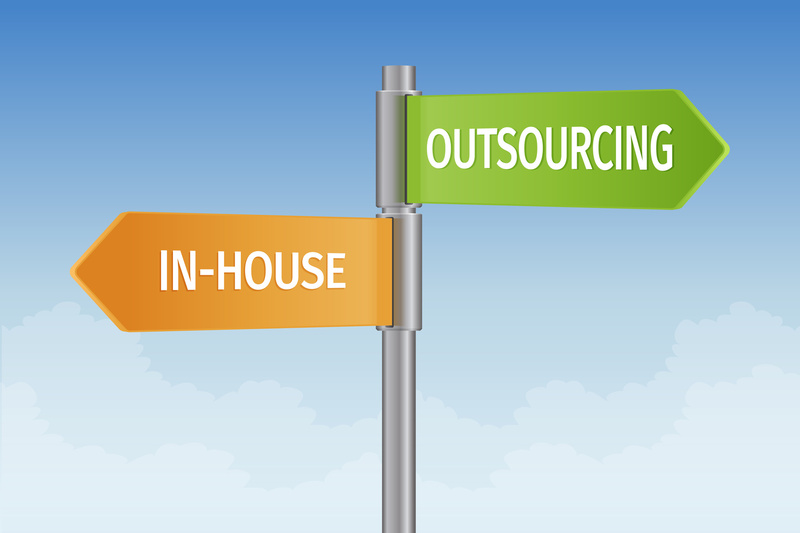 His article looks at whether to opt for in-house DAM or to choose an outsource provider. It covers areas like control, cost, time commitment and reliability. Even as providers of an outsourced service, we recognise outsourcing MAM may not be the right answer for everyone. We certainly recommend you think hard about alternatives before making a decision. And that’s what the article aims to help with. Or if you’re still not sure what you want from a DAM / MAM, maybe the questions in our e-book can help you work it out. 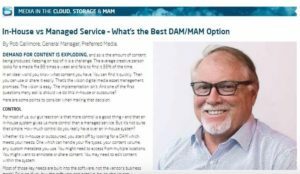 In-House vs Managed Service – What’s the Best DAM/MAM Option for You? Demand for content is exploding – and so is the amount of content being produced. Keeping on top of it is a challenge. The average creative person looks for a media file 83 times a week and fails to find it 35% of the time. In an ideal world, you know what content you have. You can find it quickly. Then you can use or share it easily. That’s the vision digital media asset management promises. The vision is easy. The implementation isn’t. And one of the first questions many ask is, should we do this in-house or outsource? Here are some points to consider when making that decision. For most of us, our gut reaction is that more control is a good thing – and that an in-house system gives us more control than a managed service. But it’s not quite that simple. How much control do you really have over an in-house system? Whether it’s in-house or outsourced, you start off by looking for a DAM which meets your needs. One which can handle your file types, your content volume, any custom metadata you use. You might need to access from multiple locations. You might want to annotate or share content. You might want to edit content within the system. Most of those key needs are built into the functionality of the software, not the vendor’s business model. So even if you buy the software and install in-house, they’re not something you can easily change! On the other hand, control also means hands-on responsibility for implementation and management. So you now have to look after things like system configuration, extending or replacing hardware, software patches and upgrades, user administration and so on. That’s a lot of time and expertise you need. Does ‘control’ still sound so much like a good thing? When we ask our clients and prospective clients about digital asset management, the number one challenge they identify is time – or the lack of it. Digital asset management is like filing. It’s important to everyone, but it’s not top priority for anyone. So when time is tight and deadlines loom, it gets pushed to the back of the queue. And let’s be honest, most of us don’t actually enjoy it that much either. Updating metadata and uploading files just doesn’t compare with working on a creative pitch. Or shooting film, or editing it into something spectactular. Very large corporations may have a dedicated team member who specialises in digital asset management and supports the rest of the business, but it’s not common. So the day to day of digital asset management just doesn’t happen. No one notices immediately – but then one day, someone needs a piece of content and no one can find it. Using a managed service doesn’t solve this problem of time completely. You still have to get your content into the system somehow. But if all you have to do is set files to upload overnight, or send off hard drives at the end of a project, the task is much less daunting. A robust, repeatable process which suits your business workflow can ease a lot of issues. If you don’t have the time to manage your content assets effectively now, what makes you think you have the time to choose, install, configure, implement and manage DAM software? If you’ve got an in-house system, you’re dependent on your IT team when something’s not working or you need help. You know how they perform now – is that going to work for your DAM? What out-of-hours support do you have or need? How many experts in DAM are on the team? What happens when those experts are on leave, or off sick? What if there’s another IT emergency or a major project underway? Even the best of in-house teams tend to have conflicting priorities. Companies offering managed services have a more focused IT team. Deeper expertise. More experience with the commonest issues in their system. And more to lose if the DAM or MAM is down. Last but by no means least, what’s the relative cost of an in-house system versus a managed service? There is no easy answer to this one. But if you’re doing a cost comparison, be sure to compare all the costs of both options. Time cost of installation, upgrades, maintenance and troubleshooting. This can include the IT team (or business people) supporting users who aren’t familiar with the system. It’s also worth noting that the cost of a managed service is usually more predictable and consistent than for in-house systems. You don’t get sudden large charges for things like a new server or an annual maintenance fee. If your company’s cashflow is tight, this may be an advantage. The need for good digital media asset management is not going to go away. Time spent searching for or recreating media files is time wasted, opportunities lost. So the sooner you get your DAM in order the better. But take the time to think seriously about how you want to handle DAM. For maximum control and freedom, you can buy some software and go it alone in-house. But Successful DAM / MAM takes more than just software. It involves ongoing investment in infrastructure, people, expertise, process and other resources. Build that into your planning. Or you can opt for a managed service – you’ll have fewer options on configuring the system, but the solution is fully scalable, you don’t have to support the technology and you don’t have to make any capital investment. It’s not a question of software functionality, although your choice has an impact on which specific software solutions are available to you. But unless you have very specific needs, you’ll be able to find both in-house and outsourced options which match your needs. This is a strategic decision. Are you content creators only? Or are you content creators and managers? Do you want to drive the car? Or do you want to service and maintain it as well?